My name is Amanda Ellis Graham. I am 37 years old and was diagnosed with Multiple Sclerosis 19 years ago, when I was just 18 years old. I am a 4th generation autoimmune patient living with MS. My great grandmother and grandmother, had crippling Rheumatoid Arthritis and my mother has been living with MS since I was born. In June of 1998, I had my first symptom that didn’t go away. My right leg went numb, then the other. I was terrified and didn’t want to say anything. When my right eye went blurry from optic neuritis 3 weeks later, I finally went to my Mom. I was diagnosed very quickly by my mother’s neurologist with one legion, July 20, 1998. Trying at first to hide from my MS was very hard, in my late teens. I was trying to deal with it one year after graduating High School. I ended up having to drop out Weber State after only two quarter’s, when my right hand and arm went numb. I was unable to hold a pencil. Living with MS through my 20s was a constant battle. I was Working two jobs, had my own apartment, and was in and out of school through my 20s. I just wanted to be “normal”. I loved my jobs and was promoted at both, despite dealing with many symptoms at the time. They included vertigo, numbness, spasticity, fatigue, nausea, and weakness in arms and legs. In 2008 after being put on disability 4 times that year, I was put on permanent disability in September. I am still on disability 8 ½ years later. I was house bound or in a wheelchair for 5 years. I had a hard time with simple every day tasks. I could not shower, walk to the bathroom, make food, go to the store, drive, clean, use my computer or leave the house. I also had a very hard time reading, writing and sleeping. I did not have a life. For those years, I dealt with insomnia, irregular sleeping in the day, atrophy, unable to eat (mal nutrition), and only left the house for my monthly Tysabri infusion for my MS. I have suffered depression and have been near suicide. To put it bluntly I was miserable. After being diagnosed for over a decade I have been put on many prescriptions for many symptoms. I am now on very toxic doses of medications. I have had and continued to have appointments scheduled for me, suggesting that I get of my benzodiazepines. They worry that I might stop breathing in my sleep, being on that toxic dose of medication. Anytime I tried cutting back I would end up in the ER being diagnosed with stage 3 anxiety and them telling me to continue to take my current medications. After being scared enough times, at one of my appointments I joked about going to Colorado and wondered if that would help? It turned to an actual conversation after that. After that appointment and months of thinking and debating about it, I decided to start using Cannabis. I have been able to cut back on meds and continue to do so. But I had no idea what Cannabis would do for me. I have been using Cannabis now for 3 ½ years. At first I started seeing improvements in anxiety, sleep, appetite, depression, bladder function, pain, and nausea. After just a few months, I started noticing bigger things. It started to help my vertigo, balance, neuropathy, being able to shower on my own, strength, and spasticity (tightening of muscles). I have stretched my gait out more than 3 inches and no longer need a wheelchair. I am mobile with my cane. I can drive again and can now run my own errands. As a result, I am gaining my independence back! Cannabis has given me the ability to be a part of life again. I get to go advocate for cannabis, because of cannabis. 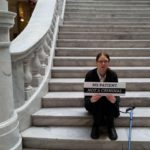 This is the 3rd year I will be up on the hill advocating for medical cannabis. This plant that was given to us then taken away, is harming so many Utahans. That’s why I feel I NEED to speak up about it. I am so grateful that I CAN! Cannabis has given me the chance to do this and get my life back!